Phinda Private Game Reserve combines a truly unique wilderness with luxurious finery. 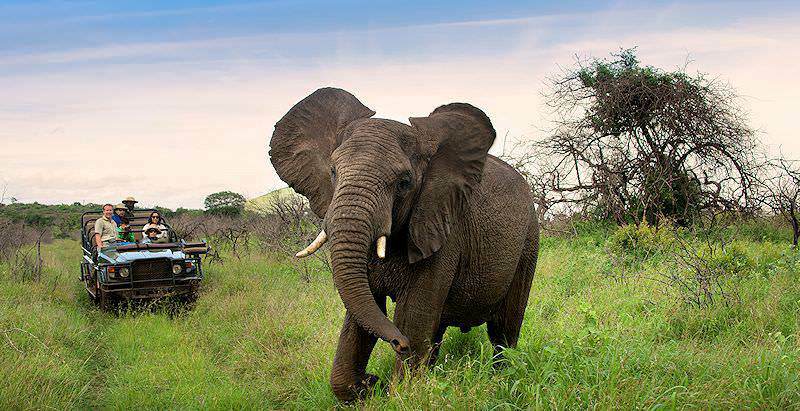 The Phinda Private Game Reserve is situated on the unspoiled northern coastline of KwaZulu-Natal in South Africa. The natural beauty of Phinda is breathtaking. There are seven distinct habitats in the reserve, sometimes referred to as “seven worlds of wonder”. Phinda has everything from unblemished beaches to marshland, woodland, grassland and forest. The very special dry sand forest is home to the red duiker and suni. Phinda also hosts the largest privately-owned nyala population in the world. The reserve takes up 23 000 hectares of some of the most spectacular natural beauty in the country and offers a perfect bush and beach adventure. Only here can a visitor see elephant, rhinos, cheetahs, whale sharks and dolphins in one day. Phinda (which translates to 'back to the wild') offers seven distinct habitats with accommodations adapted to suit and blend into each environment. All the lodges have to perform eco-audits in order to achieve an ideal condition where they put back more than they take out. All Phinda's lodges offer luxurious five star accommodations with high levels of personal service and attention to detail. Similar safari activities are conducted from each of the lodges. Forest Lodge hosts 16 suites that can accommodate up to 32 guests. It is child-friendly and offers internet access as well as child-minding services. The glass suites are built on stilts, creating the illusion that they are floating above the floor of the rare sand forest. All suites have a private veranda and personal bar. Rock Lodge clings to the side of a rocky cliff overlooking the spectacular Leopard Rock. There are six suites to accommodate 12 guests. Because of the location, children are not permitted. All suites are en suite with a personal bar, plunge pool, private sitting area and deck. The main guest area has dramatic fire places and a shaded deck. Millions of years ago, the sea used to be further inland, reaching the area which is now referred to as Africa’s sand forest. This rare terrain and the unique ecosystem that has formed on the sand dunes is an asylum for various animals, including the black rhino. Guests to the reserve can even stay in the sand forest region at Phinda Forest Lodge. Phinda Private Game Reserve is located in the wetlands region of the South African Eastern Coast, and ocean adventures are easily accessible from Phinda at the nearby Sodwana Bay. Guests can visit the bay to go diving, snorkeling and fishing. The area is widely renowned for its diving spots, such as Seven Mile. The reserve encompasses seven distinct ecosystems, which in turn have created a multitude of different habitats attracting a wide diversity of animals. This includes the Big Five, and a great number of antelope species. Combined with a tropical climate, and mild weather conditions, guests can visit all of the ecosystems at any time. If you are traveling directly to Phinda Private Game Reserve you will be welcomed at OR Tambo International in Johannesburg and assisted with transferring to Richard's Bay Airport, which is less than two hours' drive from Phinda Private Game Reserve. The option also exists to take a charter flight directly to the reserve, which has its own airstrip. 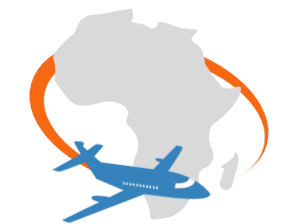 The reserve is located approximately 135km from Richard's Bay Airport. Guests will be transported from the airport in a private, air-conditioned vehicle by an experienced guide along the sugarcane plantations and the tropical surrounds of the KwaZulu-Natal north coast. 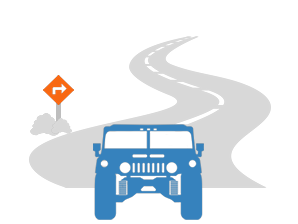 The two hour scenic drive is a great way to familiarize yourself with the area. 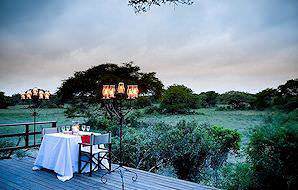 The best time to visit the Phinda Private Game Reserve depends on your safari preferences. The reserve is located in a malaria zone, and the risk is always higher in the wet summer months, whilst being almost non-existent in the dry winters. It is also the easiest to spot wildlife during the winter as the vegetation thins and the animals stay close to the water sources. In the summer the rains transform the area into a lush green African bush, and new-born animals can be seen everywhere. It is also the best time for birding, as the migratory birds from the northern hemisphere make their annual return to the south. The summers can also become very humid as the pressure builds before the rains. The Phinda Private Game Reserve was established when Trevor Coppen, a property and timeshare developer, was driving from Durban to the little village of Mbazwana through an area known as southern Maputaland. The area was, at that time, covered with farms for cattle, pineapples, cotton and hunting. Coppen had the idea that the area could be restored to its original, natural state and thus exist as a prime game reserve. Coppen began by investigating the area and decided that it could indeed be done. By buying up adjoining farms and taking down fences, he gradually enlarged the area until Phinda was born. In February 1991, the Phinda Private Game Reserve was officially established. “Phinda” means "return to the wild", which is what eventually transpired on the reserve. 120 kilometers of fencing had to be erected and thousands of animals had to be re-introduced to the area. The buffalo quarantine protocols developed at Phinda have become accepted as the national protocol for relocation of buffaloes onto private land. Through Les Carlisle and his team, Phinda was the first reserve to use sedation techniques to socialize animals from different prides before releasing them into the wild. The reserve was also the first to transport sedated lions by air. Their techniques and protocols are today recognized as excellent examples of predator reintroductions. The elephant reintroduction techniques developed by Les and the Phinda team have revolutionized the way elephants are captured internationally. With an estimated 400 species of bird, Phinda Private Game Reserve is a bird watcher's paradise and, because of the different habitats, a large diversity of birds can be seen in the reserve. On the river and surrounding wetlands, you may encounter waterbirds of every description, fishing and snacking in their preferred habitat. When Phinda was being stocked with game, cheetahs were re-introduced to the area after an absence of 50 years. Today Phinda has a healthy cheetah population which is the subject of an on-going research project focused on their habits and family units. The shy leopard also makes his home within the Phinda reserve, as do lion, elephant, white rhino, black rhino, buffalo, crocodile and hippo. The lion population is unique in that prides were artificially “constructed”. By using a sedation technique, the lions were socialized until they had accepted one another and were then released into the wild. Visitors may also view sea turtles laying their eggs on the beach before disappearing into the ocean again. This magnificent spectacle can only be experienced by a very select group, as the turtles and their eggs regularly fall prey to the unscrupulous or uninformed. By visiting Phinda, a guest can become one of the chosen few. The Phinda Private Game Reserve in northern KwaZulu-Natal consists of 23 000 hectares of prime natural surroundings with seven distinct habitats. The area is humid with summer rainfall and visitors are welcomed all year round. Phinda is a low-malaria area but it is still recommended that guests take precautions. The spectacular reefs and beaches nearby also offer visitors scuba diving and snorkeling opportunities. The warm water of the Indian Ocean is home to whale sharks and dolphins. Located between the St Lucia Wetland Park and the Mkuze Game Reserve , Phinda offers unique experiences for the discerning traveler. The unusual sand forest is thought to be a relic of dune forests that have been separated from the ocean as the shoreline eroded over millennia. Climatic changes caused dune shifts and, as the shoreline tempered, the sand forest became a habitat on its own. The sand forest habitat in Phinda is home to many of the shyer animals, such as red duiker and the rare suni. The wetlands habitat (also known as vlei-lands) is nature’s water filter and plays an important role in the sustainability of the entire eco-system. Populated by a plethora of birdlife, the wetlands of Phinda attract a variety of animals in search of water and food. The savanna habitat is an expanse of grass interspersed with clumps of trees. It is here where visitors will find the bigger game species such as elephant, rhino and lion. Savanna covers about two thirds of South Africa and is the most common terrain type to be found in Phinda. Imagine an African safari at the beach. It is not abnormal for guests at Phinda to view lions, rhinos, elephants and dolphins on the same day. In the wildlife section of the park, guests can experience game viewing in open-air 4x4 vehicles, or through interpretive bush walks led by armed expert game rangers. Canoe and boating safaris are available on the Mzinene River - a great way to view the birdlife and crocodiles and hippopotamuses in their natural environment. Traveling down the river as the sun sets is also exceptionally beautiful. An array of beach activities are also on offer to guests, and avid scuba divers can even arrange to visit some of the world-renowned Sodwana Bay diving sites. Guests can explore the park from the skies, which makes spotting larger animals such as the elephant, or even whales possible from a great distance whilst experiencing the changing landscapes. Guests can immerse themselves in the culture of the Zulu communities that reside in the area by visiting traditional homes and meeting some of the locals. Phinda is a great place for stargazing, and some of the lodges even offer an entire night spent under the stars (don’t worry - an armed ranger will keep a lookout while you sleep). At Phinda Private Game Reserve, the experiences that guests relish most are often more simple than the drama of a cinematic sighting, from appreciating the distinct eco-systems to savoring each lodge's unique location. At Phinda you have the amazing opportunity to track black rhinoceros on a guided bush walk. The bushveld seems to go strangely quiet, and you can hear your heart beating in your head, and then suddenly you freeze as you observe the majestic creature in its natural habitat. 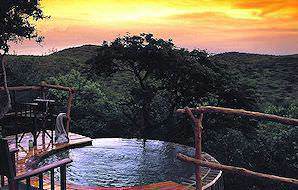 The Phinda Private Game Reserve encompasses seven distinct ecosystems. From the immaculate sand forest to the mountain bushveld, guests can be sure that they will encounter a diverse range of fauna, flora and breathtaking landscapes. Each of the lodges at Phinda has been specifically designed for the best aesthetic and most comfortable experience possible. Glass lodges in the forest, stilted suites on the wetlands and the rock lodge built into the cliffs, for example, cater for every preference. Yes, Sodwana Bay on the coast is easily accessible. Why is it often referred to as the “Seven Worlds of Wonder”? This is because of the seven distinct ecosystems on the reserve. What type of activities can we partake in by the coast? There is scuba diving, fishing and even turtle watching. What will we see when going scuba diving? Plenty of fish, and the spectacular coral reef in the Indian Ocean. There are lodges on the reserve that have swimming pools available. Are there game drives available? Yes, two game drives on a daily basis are standard inclusions at the lodges. Can we take a cruise on the river? Yes, Phinda is one of a handful of reserves in South Africa that offers water-based safari activities. Travel to South Africa for an African vacation steeped in diversity. Botswana is known for its painstakingly preserved safari areas. Travel to Namibia for a range of enthralling desert adventures. Travel to Zimbabwe for an unforgettable look at the Victoria Falls. Mozambique's stunning archipelagos are remarkably untouched. The Kruger National Park is a sprawling two million hectare conservation area in northeastern South Africa. The Sabi Sand Private Game Reserve stretches across 65 000 hectares of lowveld wilderness, sharing an unfenced border with the Kruger Park. Our tours of Cape Town are popular amongst all types of travelers, from outdoor enthusiasts to families and honeymoon couples. The Garden Route is one of South Africa's most appealing destinations, offering both leisure and adventure opportunities.